hum, I joined the team after 1.0, so, no idea. Ok I ‘ve found the problem. hum I’ve a problem to send the file : it’s very slow today. This reply was modified 1 year, 11 months ago by antony0509. and What should I see ? does the kernel stop at 2,29 s ? you have no more lines ? 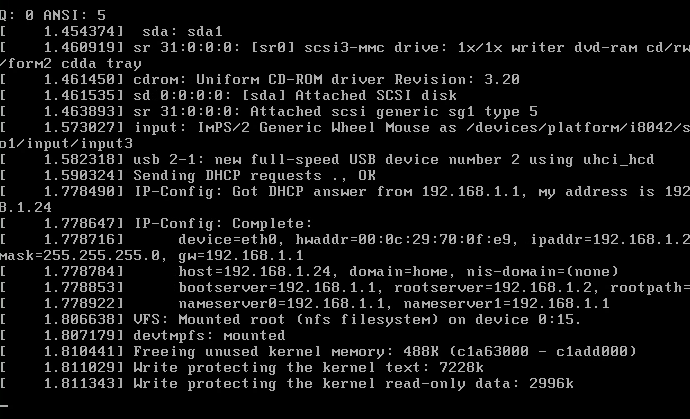 I can re-test from my side, but I used a basic kernel from our distro with the command lines posted previously. I don’t think it makes difference but I use vmware now. are your sure your dhcp server is ok ? As you use virtualbox, double check using an iso that you have a working network interface once booted. And look if the problem does not come with the virtual ethernet interface configured on virtualbox (should be configured on the same lan than the host: shared). And you can change the device too to test.